A little bridge will make a big difference! The Northern part of the Sulechow – Lubon line (no. 357) is to be modernized. The track will upgraded, signals refurbished and stations tidied up. The permanent way work will include cleaning and replenishing ballast, renewing point components and replacing defective sleepers. The biggest civil engineering work will be replacing the bridge at km. 109.548 near Lubon which has long had a weight restriction. The 20 million euro project is being 50% funded by EU Regional Development funds and is scheduled to for the period 2009 – 2011. 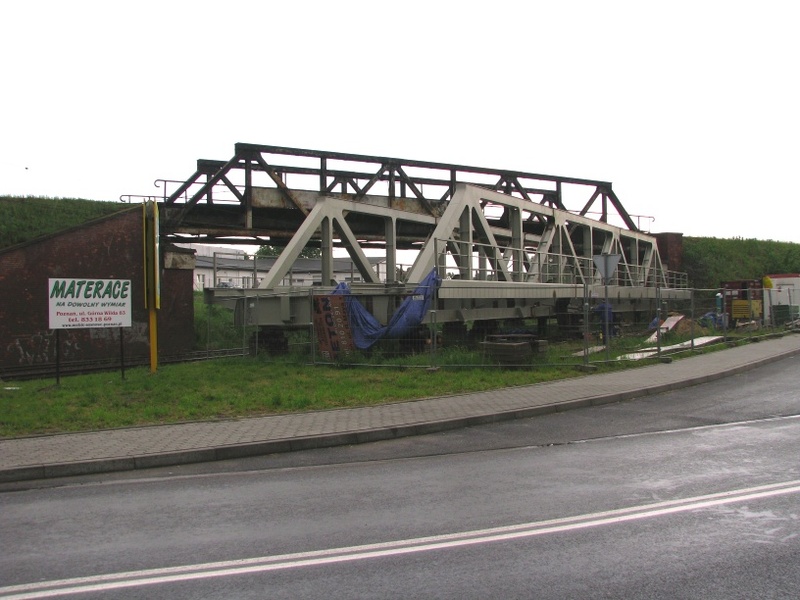 The replacement of the truss bridge over the Poznan – Wroclaw railway was scheduled to commence in the 3rd quarter of 2009, but looks to be complete in a couple of weeks time. Surely this must be a record for PKP’s infrastructure company, PKP PLK? The completion of new bridge will bring a smile to railway enthusiasts all around the world. For the section of Line 357 due to be modernised – from Wolsztyn to Lubon – is the last place in the world where steam engines haul regular service trains, The weight restriction on the old bridge was the reason why steam haulage of the Wolsztyn – Poznan scheduled steam services was mainly carried out by the Wolsztyn Ol49s. 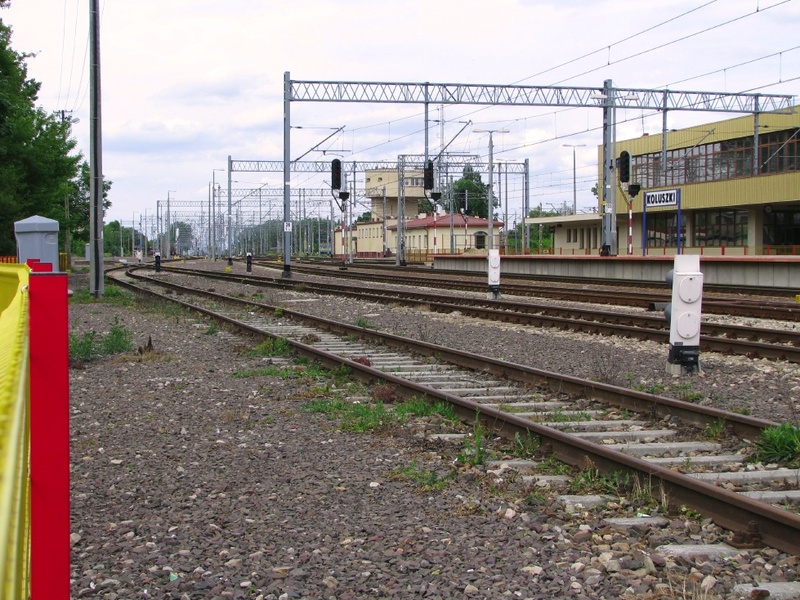 The new bridge should allow heavier locomotives to be employed occasionally on the Wolsztyn – Poznan. Busy scene in Smigiel yard on a rainy morning on 29.06.2009 in preparation for running three trains in simultaneously! The newly refurbished Romanian railcar will form the service train to Stare Bojanowo while the Lxd2 will haul the second of the day’s two special trains to Wielichowo. All photos BTWT. 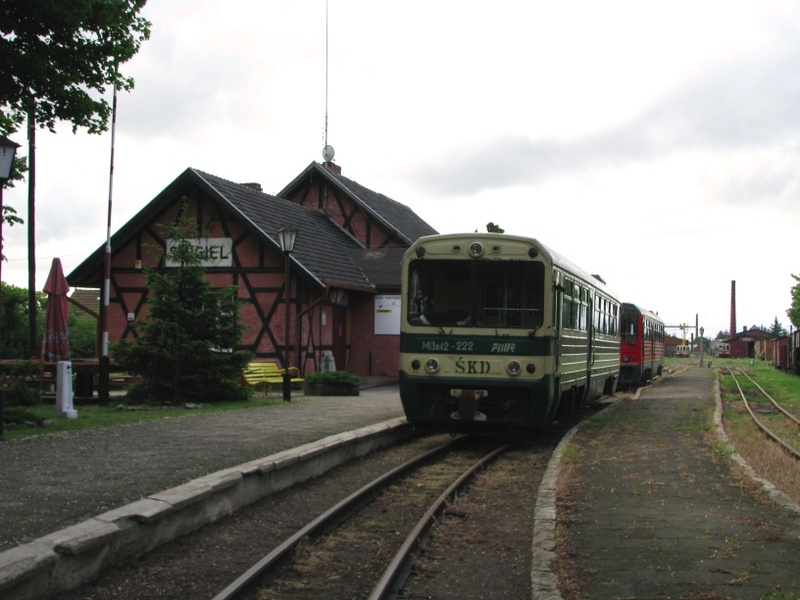 Smigiel Town Council and PKP have completed the lengthy legal process of transferring the ownership of the line to the Town Council. 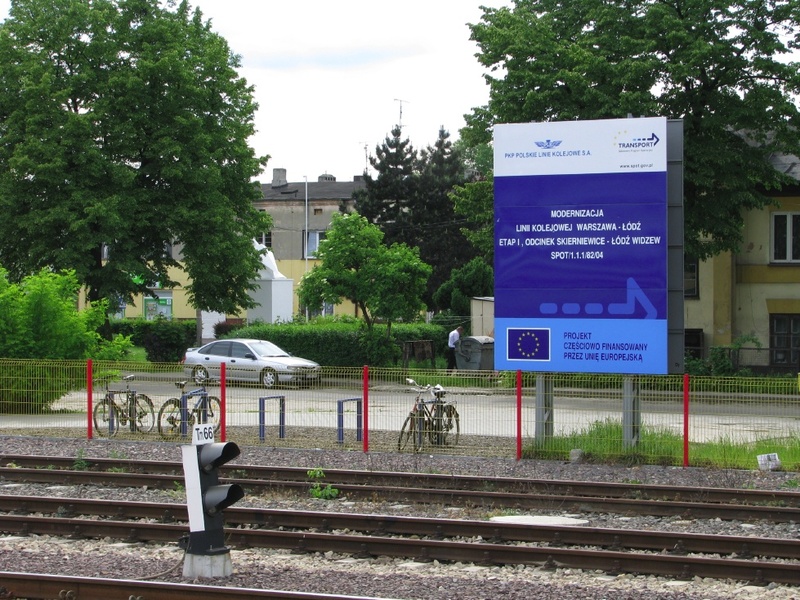 Whilst this should be a cause for celebration – in theory the way is now clear for the Council to apply for EU funds – the Polish reality is more prosaic – long discussions will now commence between the Council and SKPL regarding the latter’s operating agreement. High on the Council’s agenda, is a demand that SKPL pay council tax in respect of the railway land. Most unprototypical! The special to Wielichowo (nearest camera) and the service train to Stare Bojanowo wait in the same road. In PKP days trains to Stare Bojanowo would have used the right hand road. The driver of the service train gives his railcar a last minute check. That curve really needs some attention. The first special crosses the main road. Freight traffic on the Stare-Bojanowo – Smigiel line seems to be bearing up with two rakes of standard gauge freight wagons expected shortly. If arrangements proceed as planned the Px48 from Gniezno hired by the Wolsztyn Experience will visit the line in September and October. Click for details of licensing. 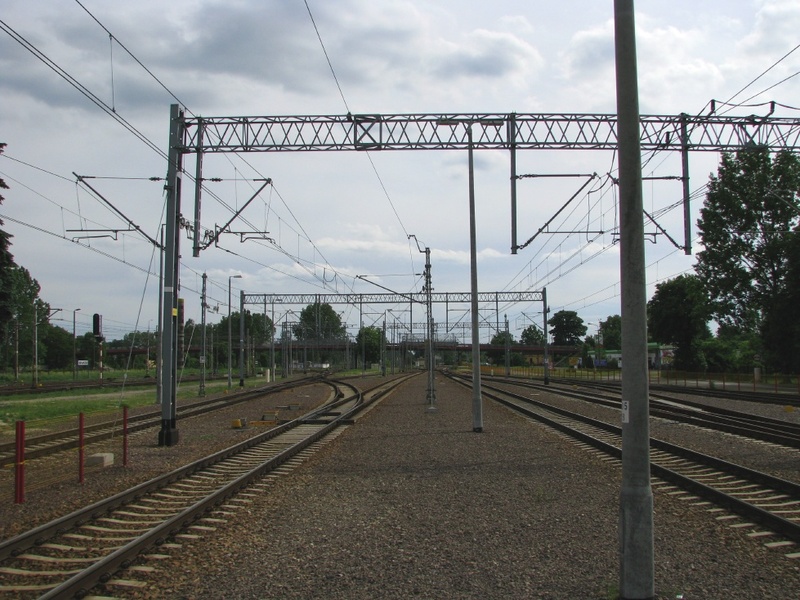 The railway line between Warsaw and Lodz is being modernized in stages. 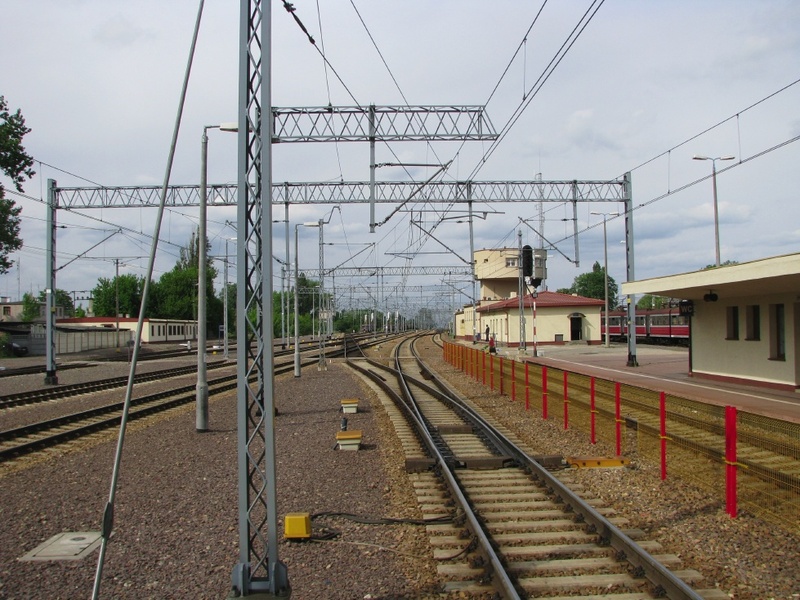 Stage 1, the rebuilding of the line between Skierniewice and Lodz Widzew, was started in July 2006 and completed on 16 June 2008. The cost of the project was 905,151,233 PLN, of which 678,863,425 PLN was funded by the European Regional Development Fund and 226,287,508 PLN by the Polish Government. At the time, the project was billed by PKP as the biggest infrastructure in Poland. We took our Chief Engineer to Koluszki1 station, the site of a major junction on the line, and recorded his comments. All photographs were taken on Sunday 24 May, 2009. Click twice on the pictures for a magnified view. 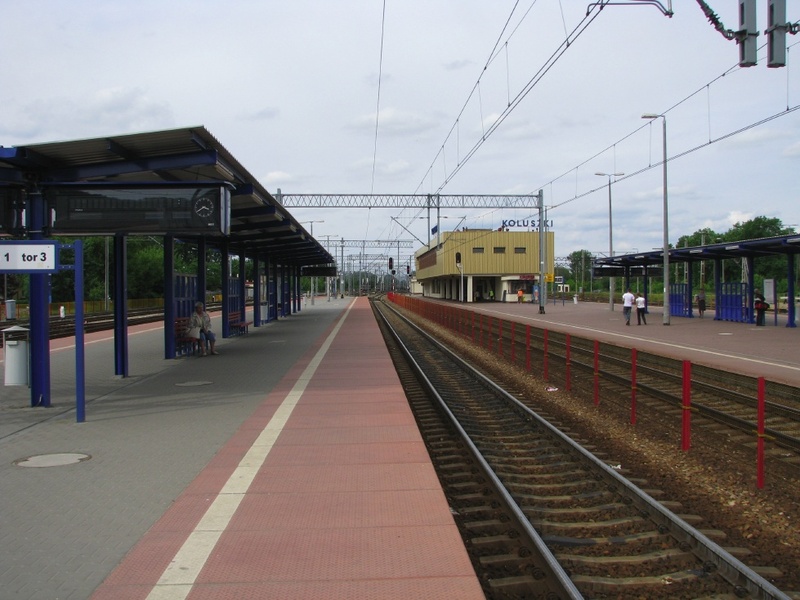 The new platform for the Warsaw – Lodz services is on the left. Other trains use the older platform on the right. 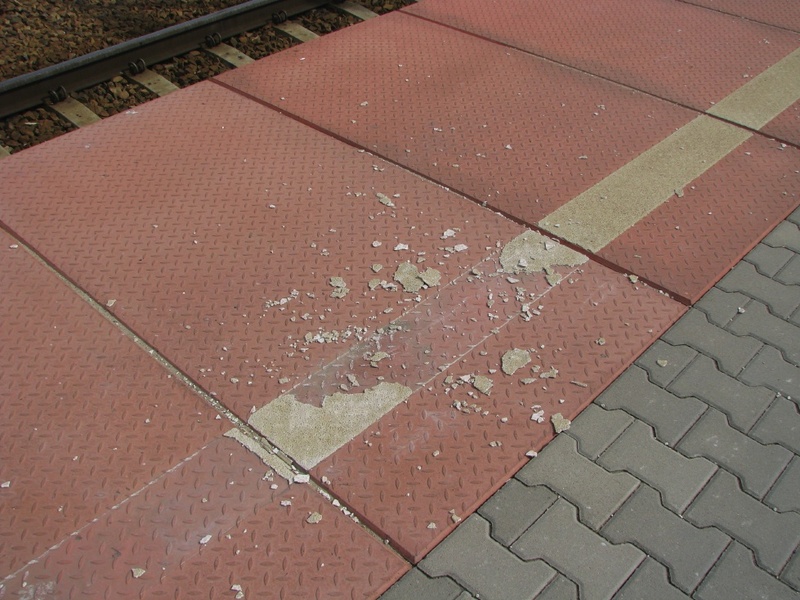 The Lodz platform on the left seems OK, but read on. The platform on the right – rebuilt in the 1970s – has been resurfaced but not raised. The new platform awnings constructed on both platforms stop about a metre short of the platform edge and don’t reach as far as the subway or the ticket office. The main line for Warsaw trains appears to be well laid out for 160 km/h running. But what is the lady with the shopping trolley doing on the staff crossing? And why is there no warning device which is activated when a train is about to cross. Once again, the lines for the Lodz services seems well laid out. The tracks to Tomaszow Mazowiecki and Piotrkow Trybunalski less well so. Let’s hope that the lady with the trolley is clear of the crossing. 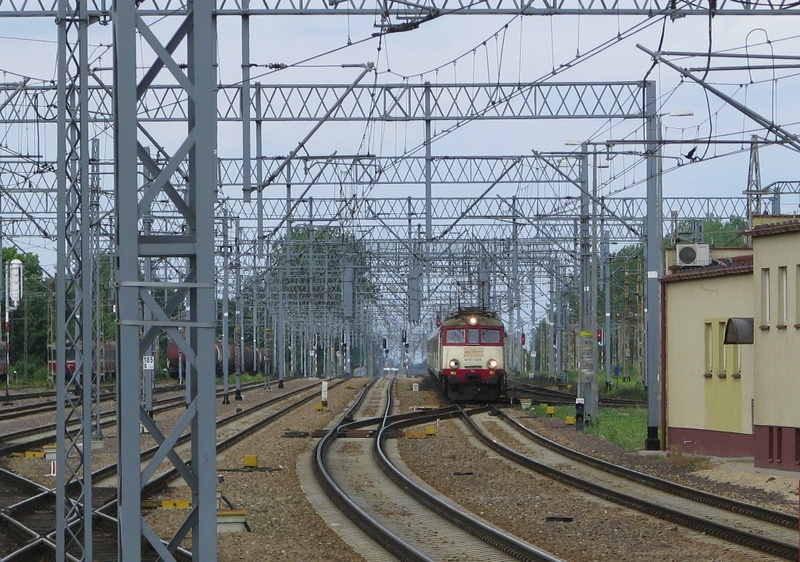 Clicking the picture for an enlarged view shows that one of the ‘main lines’ is in fact a badly aligned dead end and that Warsaw bound trains leaving the Lodz platform road have to negotiate a couple of crossovers to reach the running line. Weeds sprouting up in the newly laid sidings. It would appear that the reused ballast has not been properly cleaned and screened. The white line is disintegrating. The home-made concoction of cement and paint has not lasted one winter! The appropriate material for the job is thermoplastic paint. Overall, this seems to have been a modernisation carried out on the cheap where a glossy appearance took precedence over functionality. It would have been appropriate to conclude this article with a Google Maps view of Koluszki station, but unfortunately in the satellite photography purchased by Google, Koluszki station is under a cloud! 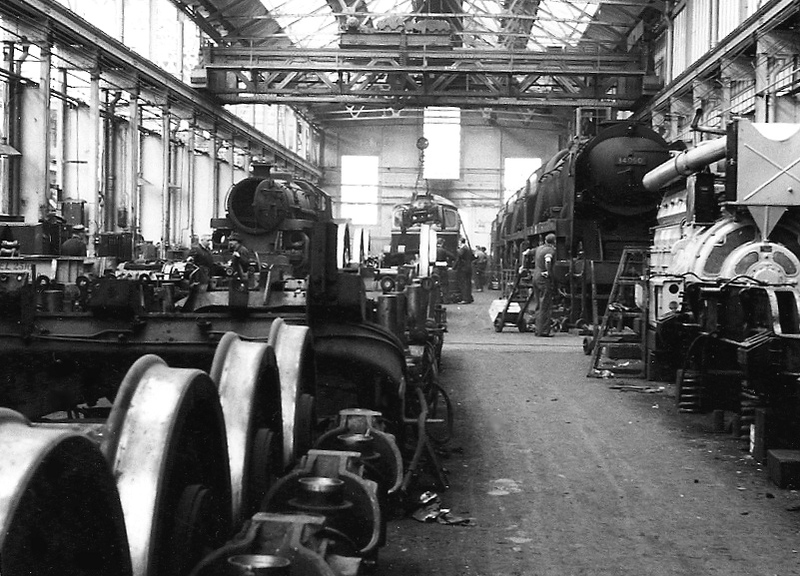 Eastleigh Works in 1966. Photo BTWT archives. Eastleigh Works is to Southern Railway fans what Swindon was to followers of the Great Western Railway. The London and South Western Railway moved its carriage and wagon building and repair to Eastleigh from London in 1891 and built its new locomotive works here in 1909. The L&SWR Chief Mechanical Engineer, Dugald Drummond, built his S14, M7, P14, T14 and locomotives here. Robert Urie went on to construct the H15, S15, N15 (King Arthur), G16 and H16 engines. After grouping of the railways into the ‘Big Four’ Eastleigh became the principal works of the Southern Railway. Richard Maunsell built the Lord Nelsons, Schools, U1, W, and Q locomotives at the Works. Under Oliver Bulleid, Eastleigh Works built all thirty of his Merchant Navy and six of his West Country locomotives. During the WWII the Works built a batch of Stanier 8Fs. Steam locomotive building at Eastleigh ceased in 1950, though heavy overhauls of steam locomotives was to continued at Eastleigh almost until the end of steam on the Southern in July 1967. Between 1956 and 1961, nearly one hundred Bulleid pacifics were rebuilt here. In the 1962 the carriage works site was sold and all work was concentrated in the former loco works. The reduced Works survived privatisation and was taken over by Alsthom. In March 2006 Alsthom, closed down its Eastleigh operations and sold the site to a property developer. Miraculously railway work continues at Eastleigh for the moment, the site is rented by Knights Rail Services and is used by a variety of train overhaul companies. During the bank holiday weekend (23-25 May) Eastleigh Works is holding an open day to celebrate its 100th anniversary. Well worth paying a visit while you can! A group of us visited Rogow last weekend. The scene resembles a typical Polish narrow gauge railway during Poland’s post-war minor railway boom. Coaches and goods wagons are scattered around the yard. A couple of Px48s wait their turn in the distance. It just needs a scenographer to dress the film set, apply some dirt and grime to the rolling stock, insert a couple of smoke cartridges into the smokeboxes and the illusion would be complete. No wonder special trains for wedding parties have become popular here. It is a journey back in time to the days when the Catholic Church and the Communist Party were locked in a fierce battle for the nation’s souls, and traditional Polish family values prevailed. There is much to admire at Rogow. The standard of restoration – nearly all carried out by volunteers – is very high and most of the rolling stock actually runs. Sadly the two Px48s are static exhibits only. There is a small museum which helps put the railway into its historical context. (The line started as a German 600 mm gauge military railway. The 48 kilometres from Rogow to Biala Rawska were laid down in one month – March 1915!) Nor are all the attractions just for dedicated railway enthusiasts – a small platelayers’ trolley is available for children most weekends. On a UK heritage railway, the safety officer would have apoplexy. Here, however, the watchful eye of a member of staff aided by the efforts of anxious fathers provides an effective safety system. One thing that does strike a UK visitor as odd – although this is hardly a complaint – is the lack facilities for visitors to spend their money. There was no charge for car parking, no charge for entry, no charge for the trolley rides and no charge for the museum. This was particularly striking as earlier in the day we had visited the ‘Jurassic Park’ at Kolacinek a few miles distant. Here dinosaurs were few and far between, but many and varied were the ways of additional charge attractions. By the time we had added the money spent on refreshments, souvenirs and toys to the car parking, entry and ride charges, we worked out that each family had spent over 100 zloty. This is over £20 and is a lot of money in a country where earnings are about one fifth of what they are in the UK. Perhaps, given the lack of funding from official sources, Polish heritage railways need to become equally adept at parting visitors from their money. 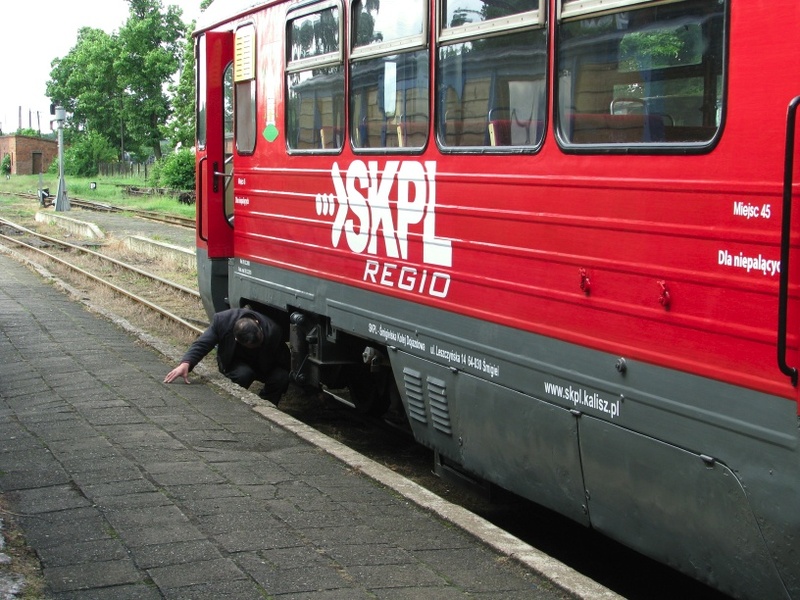 At Rogow, we had a quick whip round and each family made a donation of 10 zloty (about £2) to the railway man on duty who seemed quite embarrassed about taking our money. 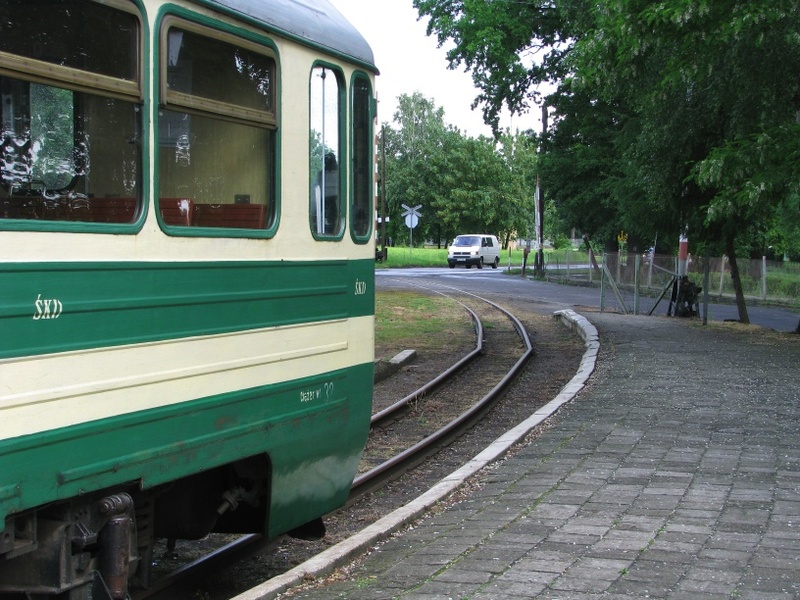 From 26 April to 4 October, trains run each Sunday from Rogow to Jezow a distance of 8km (5 miles) , departing at 11:15; also from Rogow to Gluchow, 17 km (10 miles) departing at 13:15. Four days each year it is possible to ride the whole line from Rogow to Biala Rawska, 49km (30 miles). The first opportunity will be this coming weekend on 30 and 31 May in connection with the Dni Rawskie (Rawa Days) festival. Here is the 2009 timetable which includes the details of the four scheduled workings along the whole line. a) Runs on Sundays from 26 April to 4 October 2009 and on 1, 2 May. If there are insufficient passengers the train may be cancelled. b) Runs on 30, 31 May – “Rawa Days”. c) Runs on 18 July, 15 August – “Heritage Trail Train”. Please note this is a copy of the timetable (and translation of the footnotes) available as a pdf download from the Rogow Railway website timetable page. Behind The Water Tower cannot take responsibility for and mistakes or changes. Before travelling you are recommended to check the running of your train with the Rogow Railway first. How do you assess the inner workings of any organisation? You can call in Price Waterhouse Coopers, conduct due diligence, interview the staff and put the accounts under a microscope. Or if you are in a hurry, or on a low budget, turn up ten minutes early for your appointment and inspect the toilets. What you find will give you an instant snapshot of the degree to which an organisation really cares about its customers and staff. It will give you an insight into how efficiently information flows from the bottom to the top and how quality processes work in practice. On this basis BTWT assesses the state of PKP as being somewhere on a level with the UK prison service. In an effort to improve their image PKP are asking Internet users to help choose a prize winning design for the new toilets at Warszawa Centralna. You can help improve PKP’s standing by voting here. Sir Richard Branson sets out his vision. Photo Virgin trains. It has become fashionable in certain circles to knock Richard Branson. He is now such an icon of British entrepreneurial success that its easy to forget his early David-and-Goliath battles with British Airways, which he won; and his later skirmish with the British Government over the National Lottery, which he lost. His campaigns gained him public admiration and quite a few influential enemies. More recently his foresight in copper-plating Virgin Trains’ West Coast mainline contract in case the West Coast main line upgrade didn’t go to plan – which it did not – may have upset a few mandarins at the Department for Transport. But what has really driven his opponents to fury are his view that working for one of the companies in the Virgin Group should actually be fun. To a generation of Harvard or Henley trained MBA graduates Branson’s management philosophy does not make any sense at all. Yet Britain has had its share of iconoclastic managers that were brilliant at motivating the people who worked for them. Branson is the latest of a great tradition that starts with Admiral Nelson and continues on with Sir John Harvey Jones. Great leaders who took for granted that if – you told the people who worked for you the truth, treated them as intelligent human beings and kept them informed – you end up with motivated employees who – when the going gets tough – will continue to do their job. The corporate culture within Branson’s companies, coupled with the decentralised management structure of the Virgin Group and the strength of the Virgin brand, is a recipe for commercial success that few competitors have been able to follow. So by way of contrast with what you may read elsewhere, I would like to applaud two recent initiatives by Sir Richard. The first his ‘2020 Vision’ set out at yesterday’s press conference where he shared some of his out-of-box thinking. With a £1bn investment we could, within 3 to 5 years, see our trains running at 140mph with reductions in journey times between London and all West Coast destinations. What we are asking is that the Government re-thinks the franchise situation to give train operators the opportunity to invest, grow the rail business and lessen the burden on taxpayers. Branson’s 2020 vision could lead to a railway revival within our lifetimes and improve the public standing of Britain’s railways to the point where there would be a popular consensus behind the plans to construct a new high speed network. Perhaps if Sir Richard’s vision for a new future for Britain’s railways falls on stony ground in the UK, he might consider hopping on a Eurostar and helping us restructure and modernise Poland’s crumbling railway system instead? Oh and I nearly forgot – Sir Richard’s other recent praiseworthy achievement – cancelling plans for new services between North Wales and London that would have crushed fledgling operator Wrexham & Shropshire. Maybe the bad press that the plans received reminded him of those battles he fought in the early days of his airline company, Virgin Atlantic, so many years ago. Another Polish railway water tower has been demolished. Poles don’t rate their industrial buildings very highly. Little priority is given to preserving the built environment unless the building is a church or a palace of national importance. So water towers come a very low way down the pecking order. There is no Railway Heritage Committee1 or Railway Heritage Trust2 in Poland and no list of the nation’s ‘core’ railway heritage. The legal protection enjoyed by buildings such as Slupsk water tower depends on the Wojewodski Konserwator Zabytkow – the official in each province charged with ‘listing’ historic monuments. The two Slupsk water towers were not listed. When an application for listing was lodged with him, the Konserwator Zabytkow had argued that the water towers were only important in a wider context – that of Slupsk loco depot. As that had already been demolished, the water towers merited no protection. The second water tower is due to be demolished next week. BRAINWAVE! British railway enthusiasts looking to escape spiralling price inflation in the UK and looking for an inexpensive and unusual home in Poland close to a railway need look no further than Poland’s rapidly diminishing stock of water towers! (1) A statutory body operating under the authority of the Railway Heritage Act 1996 as amended by the Railways Act 2005. It has the function of ‘designating’ records and artefacts still within the ownership of the post-British Rail (BR) industry which are historically significant and should be permanently preserved. (2) An independent registered company limited by guarantee. It is sponsored by Network Rail and BRB (Residuary) Ltd. The Trust’s role is to support with grants the conservation and restoration of historic railway buildings and structures in the ownership of the Trust’s sponsors. I have nothing against railway privatisation per se. The real impact of any change to the way a nation’s railways are governed depends much more on the initial assumptions and objectives of those who design the transformation than on whether a private company or the state treasury ends up with the ownership of the track and rolling stock. In 1948, there was significant popular support in favour of railway nationalisation as well as opposition from senior people within the rail industry. Unfortunately, the civil servants rafting the legislation and then running the nationalised railway saw it the move as a way of limiting expenditure during a period of post-war austerity. At the same time, strategic planners in the Ministry of Transport were already shaping a transport policy based on North American developments, designing a national motorway network and planning the wholesale transfer of rail traffic onto road. Britain became the odd man out in Europe – while the its neighbours rebuilt and electrified their railway networks, and introduced modern electric locomotives and rolling stock, BR continued with a policy of make do and mend and continued building steam locomotives until 1960. Note that it was not nationalisation that was reason for the relative decline of Britain’s railways, but the time and manner of its implementation. Most of Europe’s railways had been nationalised before WW II. When the war ended, there were entire ministries devoted to managing their national railways. No one stopped to think after the war whether the Europe’s smashed-up railways should be rebuilt – it was taken for granted that they should. In the UK the railways were worn out rather than smashed up. In an era of austerity the railways could be allowed to ‘make do and mend’ – albeit with the threat of losing any remaining competitive advantage. The Ministry of Transport did not have a long tradition of ‘hands-on’ management of the railways and in the post war years was to develop a critical ‘arms length’ relationship with the railway industry’s top management. Enthralled with USA ‘best practice’ – electrification and modernisation was postponed and only partly implemented. When John Major privatised BR, the public had a love hate with the railways – people loved the railways but travelled by car. Most people were unconvinced of the virtues of rail privatisation and there was much opposition to the Railways Act of 1993. There were three broad options for how the privatised railway should be structured. The management of British Rail advocated privatisation as a single entity – a BR plc; Prime Minister John Major favoured the creation of something like the former “Big Four” railway companies that had existed before 1nationalisation; The Treasury, under the influence of the Adam Smith Institute advocated the creation of 7, later 25, passenger railway franchises as a way of maximising revenue. The Treasury won. The Labour Party opposed privatisation and declared that when re-elected they would return the railways to the public sector. To make sure that this would be nigh impossible, BR was spit into a hundred separate companies with complex mutual contractual obligations. The UK privatisation model was a disaster! Such extreme fragmentation actually increased rather than decreased costs. Incidentally, the Polish government – global financial crisis notwithstanding – still seems determined to restructure and privatise its railways on the UK model! Currently in the UK the political consensus has gone full circle and the Tories are contemplating a return to the vertical integration and testing it out in Scotland if they win the next general election. A great deal of industry ‘ know how’ was lost as a result of privatisation. A major casualty was the British Railways Research Centre at Derby, an international repository of leading edge research. Opened in 1964, BR used to boast that it was the biggest railway research centre in the world. The Research Centre worked on such high profile projects as the Advanced Passenger Train, Solid State Interlocking, and rail, wheel and suspension dynamics. The latest post on the Railway Eye blog deplores the loss of so much state of the art knowledge. It seems that the Department for Transport holds a similar view. One little known Derby project that was killed in its infancy was the remote controlled self-propelled freight car. The idea was to make freight trains more truck-like, i.e. replacing ‘dumb’ goods wagons by motorised intelligent units. These units could travel long distance as orthodox trains and then be automatically broken up and re-marshalled and finally complete the last 20 miles all the way into the factory loading bay. A concept unit was built and featured on TV. The road freight lobby immediately realised the revolutionary potential of what were essentially driverless automatic vehicles that had a fraction of the fuel consumption of ordinary lorries. Urgent consultations were held and the project was immediately pulled. Only one piece of the enabling technology was reused – the dedicated secure radio channels developed to control and monitor the progress of the units became the basis for radio token system which was adopted on certain branch lines. And what of driverless self-powered freight units? It seems that some tima ago the concept was reinvented by the International Union of Railways. Sadly there is no reference to the original pioneering work that was carried out at Derby! The village of Rowland’s Castle, Hampshire lies 8 miles to the north of Portsmouth on the ‘Portsmouth Direct’ railway line which runs from London Waterloo down to Portsmouth. The railway line was built in 1859 and was electrified in 1937. In 1944, at the height of the second world war, the station was chosen as one of the de-training stations for allied troops who camped in nearby forests in preparation for the D-Day landings in Normandy. Troops would arrive from all parts of the country, de-train and travel in convoys of lorries into camp. A 10 mile deep restricted civilian movement zone was enforced all along the south coast of England and the troop camps were sealed off. Blackout restrictions applied and petrol and food rationing was at its height. Amazingly the picture at the head of this post is not a photograph of the Southern Railway in wartime, but a photograph of the Rowlands Castle Model Railway. The model buildings are based on real buildings that existed in 1944 in the village and include the station, a chapel, 3 pubs and several cottages. The colouring of buildings and landscape is based on colour photos taken from a book of USA servicemens’ photo’s taken in 1944 which are probably the first colour pictures of Britain ever taken. Thanks to the inspiration of Roye England’s Pendon the quality of railway modelling in England has improved by light years from the standards that were the norm in the 1950s and 60s. In those days a model railway was judged by the quality of the model locomotives wagons and coaches. The landscape and buildings very much took second place. Nowadays you can take it for granted that the quality of the rolling stock will be superb, the aim is to make the scenery that the railway runs through as realistic as possible. Peter Goss’s Rowland’s Castle is very, very good. If you can get to the Trainswest model railway exhibition this weekend (16 and 17 May) in Melksham you can see Peter’s work yourself and also see 31 other model railway layouts. Highly recommended. BR Standard Class 4MT 4-6-0 in 1966 or 67, Photo BTWT archive. It has been a very long day – all of it devoted to the cause of Polish heritage rail – and it will almost certainly inspire a post in due course. In the meantime, while I catch up with my beauty sleep, here is a meaty problem to be getting on with – the final mystery picture in our competition. Please forgive the dark picture of the 4MT, however today’s questions are not about the engine. For one point can you tell us – Where was this picture taken? ; for the second point – What is the narrow gauge connection? There is a bonus point if you can identify the train that has brought me from London and the 4MT is is about to haul! Although our competitions are famous for being difficult – they are not impossible. Congratulations to John Hyde who is in the lead with THREE points. He has identified the locomotive and location in mystery picture 5 AND told us where the locomotive is now. Rik Degruyter and Michael Dembinski correctly identified ONE PART of the answer to mystery pictures 1 and 3 respectively and are the joint runners up with one point each. For newcomers to BTWT quizzes – there is usually a post a few days before or a couple of days after a mystery picture is published which gives a Sherlock Holmesian clue which might be helpful in resolving the current problem. All the previous questions are still open. For the winner the prize is a bottle of the king of Polish vodkas – (Zubrowka, Bison Grass Vodka) – so let’s have a few more entries! Oh, and I nearly forgot late this evening – one year and two months since we launched Behind The Water Tower – we passed the total of 100,000 cumulative daily hits. Well done everybody. Please tell your friends about BTWT and lets see how quickly we can reach 200,000. Southern Pacific Railroad GS-4 class locomotive 4449 on the turntable outside Brooklyn Roundhouse, then departing Brooklyn Yard with Mt Hood sleeper/lounge and GN caboose to move to Union Station, Portland on 8 May 2009 in preparation for National Rail Day celebrations the following day. You Tube Video by Drewster327. At the risk of offending 90% of BTWT’s readers, I must confess that middle sized steam engines do nothing for me at all. As someone who once bought a BR 4MT tank locomotive from Dai Woodham, I freely admit that the transaction left me stone cold. (I really wanted to buy a Bulleid Light Pacific, but the loco boys were having none of it – they wanted a practical locomotive.) Similarly, whilst I applaud the Ol49s that work the daily Wolsztyn – Poznan turns, I find it very difficult to get enthused about them. However, as the engines get bigger, the sense of excitement returns. I am old enough to remember Churchward 2-8-0s hauling freight on the GWR main line, seeing Stanier 8Fs in their last days at Willesden Shed and the Riddles BR Standard Class 9F s – arguably one of the best locomotives ever built in Britain – hauling long trains of iron ore in loose coupled 4 wheel wagons on the GWR’s line to Birmingham. I dream of a 9F coming to Poland and showing Polish railway men what a well designed and well maintained British steam locomotive can do. In the meantime, I drool over pictures and videos of large USA engines, such as Southern Pacific 4449, the only surviving example of Southern Pacific Railroad’s GS-4 class. The GS-4s were a class of semi-streamlined 4-8-4 type steam locomotive.They were designed for high-speed passenger service and were used on Southern Pacific’s premier passenger trains. From 1950, they were re-assigned to commuter trains and freight services. They continued to work the occasional San Joaquin Daylight express as late as 1956 which made the San Joaquin Daylight the last streamliner train to be pulled by steam on the Southern Pacific. SP 4449 is the only suvivor of this class of 28 locomotives. (Two GS-5s, which were virtually identical to the GS-4s were also built and only differed from the GS-4s by having roller bearings. All GS-5s were scrapped.) SP 4449 was built by the Lima Locomotive Works in 1941. It was withdrawn from service in 1957 and put on static display in Oaks Park, Portland, Oregon, a year later. The loco slowly deteriorated as all plinthed locomotives always do. Removable parts were stolen and the engine was vandalised. (Polish locomotive owners please note!) A professional railway man, Jack Holst, kept the engine’s bearings and rods oiled in case the loco was ever to move again. Holst died in 1972 and never saw 4449 return to traffic. After 16 years of display in the open, 4449 was removed from Oaks Park in December 1974, and restored to working order at the Burlington Northern’s Hoyt Street roundhouse in Portland. It returned to traffic in April 1975 and hauled the American Freedom Train, which toured all 48 contiguous USA states for the American Bicentennial celebrations. Since then, 4449 has hauled steam special trains throughout the USA. The engine is currently based at the Brooklyn roundhouse in Portland where it is maintained by the Friends of SP 4449. Quarry Siding, Talyllyn Railway – An unprototypical signal box has replaced the earlier ground frame which itself replaced the weighted point lever used in pre preservation days. Apart for a few yards used for shunting permanent way trains, the siding is unused and the quarry abandoned. Yet some of the magic still remains. The pickaxe sank into the quarry face and dislodged a great lump of Talyllyn mudstone – so called by geologists because it consists of 50% stone and 50% mud. Eager hands wielded shovels and pitched the stuff into hopper wagons conveniently situated on a portable track just below the quarry face. When the wagons were full, the Chief Engineer called us into the brake van and the Ruston Hornsby diesel towed us and the hoppers half a mile down the line. Here the operation was reversed – the ‘ballast’ was dumped unceremoniously on the railway track and was shovelled over the side of a low parapet on to a farm road below. Later, the farmer would pick it up with a tractor and trailer and use it to fill in a few potholes elsewhere. The scene was Quarry Siding on the Talyllyn Railway, the time, the mid 60s and during the next few years the TR was to be my teacher as to how all ‘proper’ preserved railways (‘heritage railways’ had not been invented then!) were to be run. When we were not labouring, our working party leader organised trips to local slate quarries to show us why these lines had been built. I was drawn to the outdoor lifestyle and decided that railway preservation was to be the life for me. Roll on six years and I am in the offices of the Chairman of the British Railways Property Board overlooking the magnificent arches of Liverpool Street station. The Department of Transport had ordered the urgent lifting of the track on ‘our’ railway to stop the efforts of our group of preservationists, but we had orchestrated such a storm of protest that BR had been ordered to strike a compromise. A deal was duly struck – in return for our ‘switching off’ the storm of complaints, BR were to retain an extra half mile of track, leave the ballast and a few other items in situ. These days I am made of sterner stuff and would have demanded more, but in my defence I had only left school a few years earlier and my negotiating skills still left much to be desired! The next six years are a blur of meetings and letters. In fact, so many letters had to be written to counter the efforts of officials and opponents that a team of volunteer secretaries had to be engaged to type them all. After attending hundreds of meetings, I learnt the art of lobbying the hard way – by making mistakes. Eventually, having adopted the motto that ‘the best way to fight bureaucracy was with bureaucracy of our own’, we prevailed – the key agreements were put in place and our railway started to be painstakingly rebuilt. My dream of an ‘outdoor job’ physically rebuilding railways slowly evaporated. Having given 6 years of my life to the cause of rescuing one particular railway in England, I decided that enough was enough and that in any further contact that I was to have with preserved railways my role would be limited to that of passenger and visitor. Whatever else might happen, I promised myself, THERE WOULD BE NO MORE MEETINGS! Hand propelling a standard gauge wagon on to a 2ft 6in gauge transporter wagon, Leek & Manifold Light Railway in 1930. Frame from BFI National Film Archive film. The Leek and Manifold Valley Railway was the only narrow gauge railway in England which successfully operated narrow gauge transporter wagons to carry standard gauge railway wagons. The line was opened in June 1904. The gauge, 2ft 6in, was unusual for a UK public narrow gauge railway although it was used in the British colonies, in Admiralty depots and on certain industrial lines e.g. the Bowaters Paper Railway. The single track line ran for nearly nine miles from Hulme End to connect with the North Staffordshire Railway at Waterhouses. There were eight intermediate stations: Ecton, Butterton, Wetton Mill, Redhurst Halt, Thor’s Cave, Grindon station, Beeston Tor, and Sparrowlee. The line’s engineer Everard Calthrop was a proponent of narrow gauge railways who had achieved some distinction in the construction of the Barsi Light Railway in India. By specifying locomotives where the distribution of the weight was evenly distributed across all the axles – an idea that he had successfully proved on the BLR – he was able to use 35lb/yard rail and reduce the cost of building the railway. His plans were approved and be became the line’s engineer designing two 2-6-4T locomotives, which were built by Kitson & Co in 1904. The L&MVT’s passenger rolling stock consisted of four bogie coaches: two first class and two brake composite thirds. 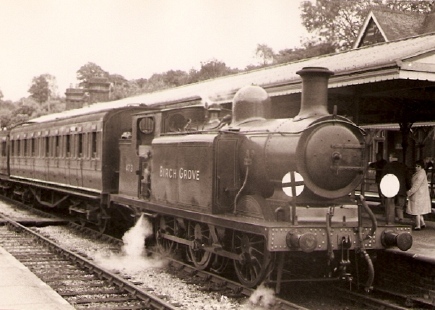 The freight rolling stock consisted of only one box van and two open wagons and five transporter wagons; Calthorpe recognizing the advantage of not having to transfer goods to and from standard gauge goods wagons at Waterhouses. There were plans to extend the line to Buxton but these were blocked by the NSR and local landowners. Without the link to Buxton the L&MVLR was a line to ‘nowhere’ and could never build up enough freight business to safeguard its future. During WW I, the line briefly came into its own carrying large quantities of milk in 17 gallon churns. After the war the line suffered from passengers and freight deserting the line in favour of road transport. At Grouping in January 1923, the L&MVLR became part of the London, Midland & Scottish Railway (LMS). The LMS ran the line for another 11 years, finally closing the line in March 1934. If only the line had survived another 16 years into the ‘preservation era’ which started in Britain on the Talyllyn Railway in 1950. Sadly it was not to be. In the 1970s a plan was put forward to revive a section of the railway as a miniature railway. Despite an opinion poll recording 98% support for the railway from the local people, the Peak Planning Board took heed of the view of a minority of protesters – including the local branch of the Ramblers Association – and turned down the proposals. Ironically at the same time members of the South Dorset branch of the Rambler’s Association were playing a key part in saving the Swanage Railway! Electro-mechanical lever frame at London Waterloo. In his youth Dyspozytor revived his school railway society. 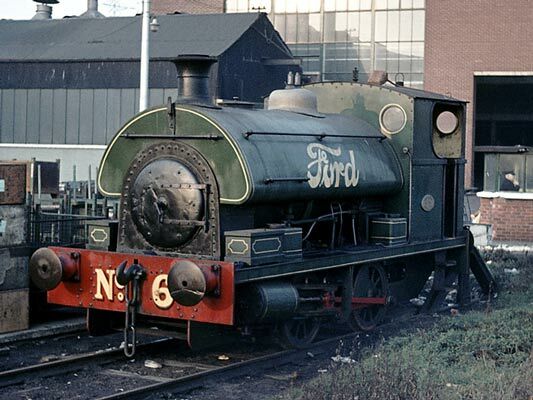 Activities included study visits to such places as Ford’s of Dagenham just before the works railway withdrew its steam engines – here he first drove a steam locomotive – and the Bowater’s railway – shortly before the paper mill abandoned rail haulage. The most popular activity was the regular screening of films from the British Transport Films library. Films could borrowed by schools at no charge. Though the film shows were nearly fifty years ago a number of great films still stand out through the memories of classroom and chalk dust: John Schlesinger’s Terminus, with its attention to detail and short story vignettes; Geoffrey Jones’s Snow, brilliantly cut in time to an avant garde musical score; and Harry Watt and Basil Wright’s onomatopoeic Night Mail. Today, many of these films can be seen as blurred fragments on You Tube, or you can – thanks to a Guardian readers’ offer – buy the entire 125 film BTF library for £75, which works out at 60p per film! Our third competition is proving quite a tough nut to crack – Mike Dembinski and Rik Degruyter are the joint leaders with ONE point each. Pictures 1 – 3 were taken within the last year or so in Poland, the next batch have been dug out of Dyspozytor’s archives and were taken in the 1960s in the UK. But what and where? On first sight, mystery picture 5 seems pretty straightforward. The locomotive is an ex *** class **** taken at ********* Works. Easy! Well no – it is not that easy. For a start to get the first point you will have to come up with the number of the loco, not just the class designation. Worked out the number? Fine, now for the second point, please identify where the photograph was taken. Here it will be helpful to remember that Dyspozytor is fiendishly devious and the ‘obvious’ answer is probably the wrong one! Finally, there is a third point to be gained by telling us where the loco is now! On 29.04.2009 the Smigiel Railway’s refurbished Romanian railcar had its inaugural run after a major refurbishment. Photo SKPL. The Smigiel Railway’s refurbished railcar looks superb after its major refurbishment and repaint in SKPL’s ‘corporate livery’. The upholstered seats are arguably the most comfortable seats of any on the Polish narrow gauge. A small oil-fired central heating boiler has replaced the coal stove which heated the coach in the winter. The Smigiel Railway looks set to have a fair season this season. The whole line to has been sprayed with weed killer and the management are prepared to accept bookings for special trains all the way to Wielichowo, although the weekday passenger service trains only run between Stare Bojanowo and Smigiel Town. The only dark cloud on the horizon is the relationship between Smigiel’s Deputy Mayor and the railway. 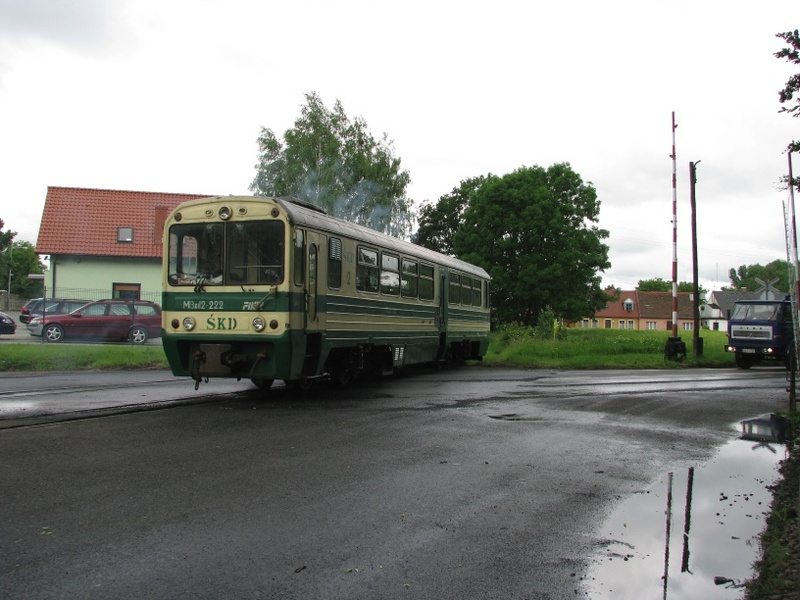 At a recent meeting with SKPL management, Mrs Wieslawa Poleszak-Kraczewska turned down an offer from an Englishman who wanted to restore to working order the derelict Px48 at Smigiel Railway Station. The Deputy Mayor also demanded that SKPL make rental payments to Smigiel Town Council. SKPL countered that if the rental demand was not withdrawn they would have no option but to terminate their operating agreement with the Council. Virgin Trains are advertising their trains on TV! The ads by Miles Calcraft Briginshaw Duffy are good, very good. These days, I never travel by car to get to an important meeting if I can at all avoid it and I have lost count of how many of my presentations, like Ed’s, have received a final polish on the train. We are living in the Age of Stress. Do you remember the days when business travel was enjoyable? In Britain, travelling by rail is more of a challenge, because so many connecting lines have been axed and – unless you are prepared to spend a whole day on the Internet planning your journey two weeks in advance – train travel is astronomically expensive. In Poland, if you take care, you can still get to most larger towns by rail, although another 7,000 km of railway imminently faces the axe. A week ago, I had a choice of two ways of travelling from Poznan to Lodz by train: Poznan – Kutno by EuroCity, 20 minute wait at Kutno, Kutno – Lodz by Pospieszny (semi fast), total journey time 3 1/2 hour, cost 125 zloty (£25); or, Poznan – Lodz direct by osobowy (stopping train), total journey time 4 1/2 hours, cost 25 zloty (£5). I took a good book and took the second option. The fastest journey time is not necessarily the best choice! PS. Thanks to The Fact Compiler and The Railway Eye blog for alerting me to Virgin Trains’ new TV ads. BTWT was out in force to cover this year’s Wolsztyn Steam Gala and Steam Locomotive Parade. Lurking in the background was the fear that this might be the last chance to see and photograph this extraordinary spectacle. Perhaps the fear that this year’s show could be the last was the reason that everybody worked so hard to make the event such an enormous success? Working steam engines illuminated by whirring coloured lights, or 18 year old wannabee models strutting up and down on a revolving flat wagon, or a dozen steam engines tethered together and making as much smoke and noise as possible – are not exactly my cup of tea. A sleepy country junction with a couple of passengers waiting to board the train is much more my scene. But deserted railways do not generate any income or public support! 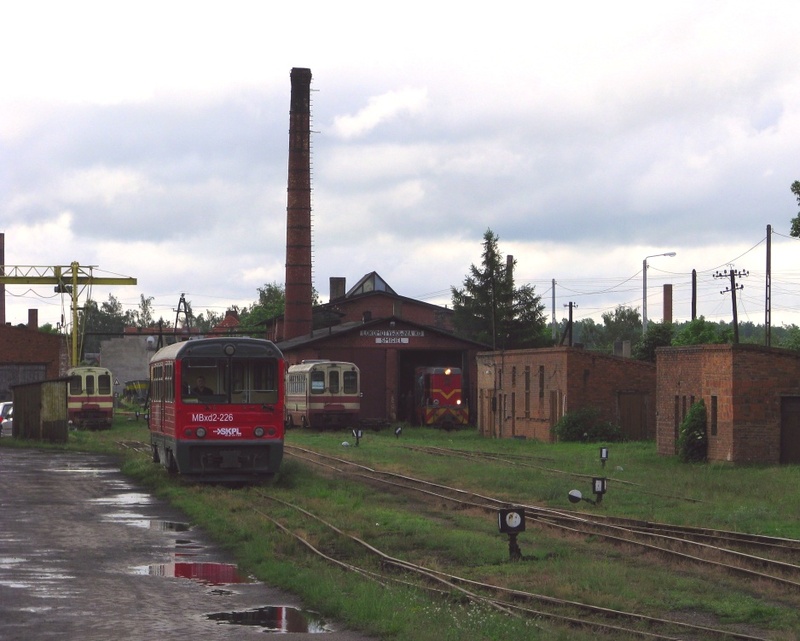 Heritage railways and steam engines have not yet captured the public imagination in Poland. So any event that shows the key decision makers the ‘pulling power’ of live steam is to be applauded. A comparison of the blurred video taken at the first Parade of locomotives in 1992 – spectators are conspicuous by their absence – and the photographs of this year’s event – crowds lining both sides of the tracks for 4 kilometres – show that the organisers know their audience and have got the basics of the programme exactly right. The key missing ingredient was the stable financial environment that would guarantee that this year’s event would take place at all. The Wolsztyn Steam Gala is a truly international event, yet visitors from countries as far away as Japan and America are not going to come in droves to an event that might be cancelled at short notice. My solution? Keep the Steam Gala as a PKP event, but subcontract the management to Howard Jones and the Wolsztyn Experience? Wolsztyn Loco Parade in 1992. Unknown camera operator.